In contrast to the deep permafrost, the temperature and depth of the surface active layer are annually varying. This is the top layer of the ground, which is subject to annual freeze-thaw cycles. The active later is of order 1 m deep in most environments, depending on the ground thermal conductivity, the annual temperature cycle, the surface type, and the amount of snow cover. In some locations, it can be several meters deep. Settings with high soil water and organic content have a high heat capacity in the near-surface layer, providing a thermal buffer that limits active layer depth. Because the active layer is directly forced by atmospheric conditions (in particular, temperature and snowfall), it is exceptionally sensitive to short-term climate change. Atmospheric warming or increased snowfall lead to warmer mean annual ground temperatures and increases in active layer depth. This results in permafrost degradation from above. Warmer surface temperatures also decrease the temperature gradient in the ground, leading to reduced conductive heat fluxes and permafrost decay at the base. When permafrost degrades, then, it commonly warms throughout, and it melts from both above and below. Relict permafrost— "buried ice"—is found at depth in many places, testimony to this process and to sustained periods of colder temperatures in prior times. Cold-based glaciers support subglacial permafrost growth, although glacier cover insulates the ground and results in thinner permafrost than would be otherwise expected at high latitudes or elevations. Permafrost likely preceded ice sheets on the landscape during the last glaciation, and after the ice advanced the ground could warm to the melting point, but no further. This would allow permafrost to persist, but it would likely degrade from below in this situation. Subsurface permafrost is frequently found in the forefield of retreating glaciers in subpolar and polar environments. If subglacial permafrost becomes isothermal, an interesting situation is possible where free water (generated from strain heating, for example) can exist at the base of a glacier in thermal equilibrium with the overlying ice and underlying permafrost. This permafrost interface would be impermeable in this situation, promoting high water pressures at the glacier bed. 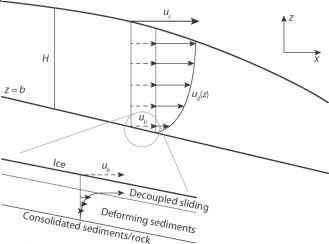 Such a situation may have contributed to the low-sloping, fast-flowing ice lobes along the southern margin of the Laurentide and Eurasian ice sheets, via high rates of glacier sliding.